4 Stalker Control Act violations, etc. Fig. 1-2-2-4 shows the number of persons newly received by public prosecutors offices for violations of the Stalker Control Act and the Spousal Violence Prevention Act over the last 10 years (See Appendix 1-4). Both the numbers have been on an increasing trend. 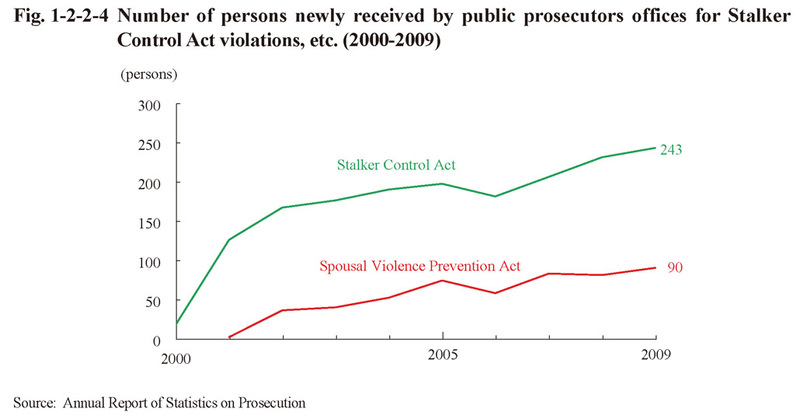 The number of persons received for Stalker Control Act violations increased by 5.2% from the previous year in 2009 while that for Spousal Violence Prevention Act violations also increased by 11.1% (id. ).